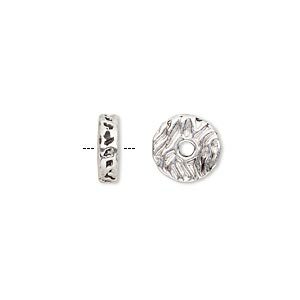 Bead, antique silver-finished "pewter" (zinc-based alloy), 10x3mm rondelle with linear design. Sold per pkg of 10. Item Number: H20-A2296MB Have a question about this item? 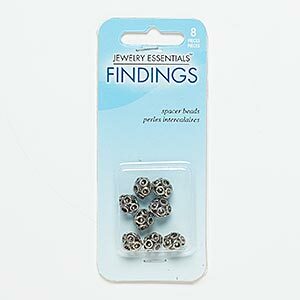 Rondelle "pewter" (zinc-based alloy) beads feature intricate detail that will enhance a range of creative designs. Lustrous antique silver finish gives beads the look of precious metal at a fraction of the cost. Stringing holes are approximately 1.8mm in diameter. Bead, antique silver-finished "pewter" (zinc-based alloy), 10x3mm rondelle with teardrop design. Sold per pkg of 10. 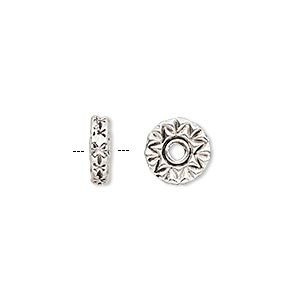 Bead, antique silver-finished "pewter" (zinc-based alloy), 10x3mm rondelle with chevron design. Sold per pkg of 10. Bead, antique silver-finished "pewter" (zinc-based alloy), 10x3mm rondelle with kaleidoscope design. Sold per pkg of 10. 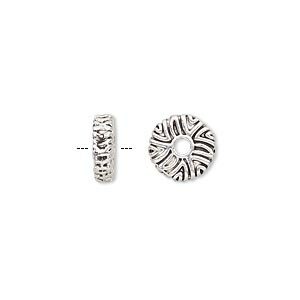 Bead, antique silver-finished "pewter" (zinc-based alloy), 10x3mm rondelle with zebra stripe design. Sold per pkg of 10. Bead, antique silver-finished "pewter" (zinc-based alloy), 10x3mm rondelle with rope design. Sold per pkg of 10. 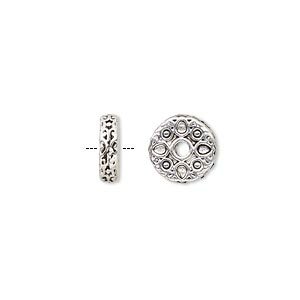 Bead, antique silver-finished "pewter" (zinc-based alloy), 10x3mm rondelle with cobblestone design. Sold per pkg of 10. Bead, antique silver-finished "pewter" (zinc-based alloy), 10x3mm rondelle with geometric design. Sold per pkg of 10. Bead, antique gold-finished "pewter" (zinc-based alloy), 10x3mm rondelle with linear design. Sold per pkg of 10. 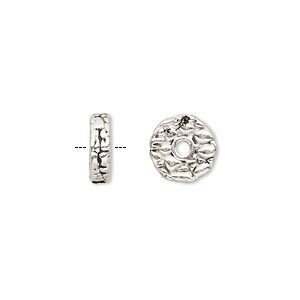 Bead, antique silver-plated "pewter" (zinc-based alloy), 6x1mm rondelle. Sold per pkg of 100. Bead, antiqued silver-finished "pewter" (zinc-based alloy), 9x8mm-10x9mm rondelle with circle and rope design, 2mm hole. Sold per pkg of 8.